I am late, but nonetheless! 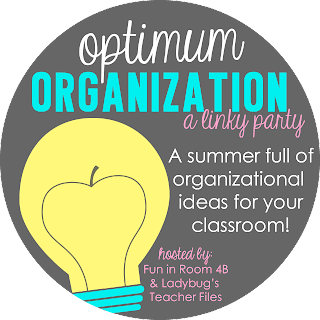 I am linking up with Fun in Room 4B and Ladybug’s Teacher Files for Optimum Organization! Happy Sunday everyone! I hope everyone is having a good Father’s Day!! This post has NOTHING to do with dads, but it is something I am super excited about. Friday, I went to school for a few hours to work. I finally had time to sit down and create my new teacher binder. It is nothing fancy, but it is very functional! I’ve had many binders in the past, but I think I finally nailed it! I guess only time will tell. I will take you step by step! So this is the cover…do you see the WRINKLES!? Well I do and I don’t think I can stand it! The paper from the Dollar Tree is cute and cheap, but VERY thin. I think I may end up switching it out. Anyway…On to the inside. On the left is the schedule. This is last year’s schedule. I hope it stays the same!! To the right is a place to keep things for on the run! I have different colored pens, pencils, highlighters, and post-its. I love the fact that I can take one notebook home for lesson planning. The next two sections are empty because I do not have students yet. LOL! Student information: Parent contact info, allergies, transportation, etc. Student Data- test scores, checklist, etc. I have then divided the binder into subject areas. The first is reading. I have included a copy of our standards based report card, standards, and curriculum map. I also included the purple folder to keep worksheets that I plan on using while I am planning. Next is writer’s workshop. I am so excited about this!! This is the first time that I have used this model and it looks amazing! I purchased Deedee Wills and Deanna Jump;s Writing Through the Year Unit 1. It has plans for each day of the unit. This is exactly what I need for my first year in kindergarten! My Math section is very similar to the Reading section. Science and Social Studies is only 30 mins. of our day, so I put them together. They are divided with the cute flower paperclip. I can already see that I will need a bigger binder! I really think this will be great to have when planning each week. I can throw it into my bag and head out the door! Speaking of bags…I purchased this 31 bag awhile back and I excited to use it this upcoming school year. It is HUGE! I am sure you are asking yourself, “Where does she keep her actually lesson plans or meeting notes?” Well look what is coming in the mail!!! I am so excited to get an Erin Condren Teacher planner!! You have to go and check it out!! I can’t wait for it to arrive! I also want to thank all of my new followers! I can’t believe I am up to 26 in just a few short weeks. I am loving the teacher blogger community! I have learned so much from all of you! Keep following along! Wow! That's a lot of work you put into that binder. You will be so glad next year when you are uber organized :) Thanks for linking up with us! I LOVE my Teacher Binder (I used Teacher Keeper). I'm working on reorganizing it this summer. I also LOVE my 31 totes. They're so durable and perfect for teachers! I bought their wall hanging organizer for next year too! I love my EC teacher planner!! They are the best!! Your binder looks super organized and your bag is adorable! Wow! You are so organized and ready! Way to go! I also adore the colors in you 31 bag! I might have to make some digital papers in those colors! Your room looks great Robyn!! You're going to make us veteran Kindergarten teachers look pretty bad when we are rushing to get it all together before school starts! ;) I love the way you hung your posters on the clothes rack. I think that I will do that. FYI...you can buy XXL Ziploc bags from Amazon to hold those posters. I did that this past Spring to hold all my monthly stuff. Now I just need to go out and buy another clothes rack and hangers.... Everthing looks great in your room! We are so excited to have you on board!